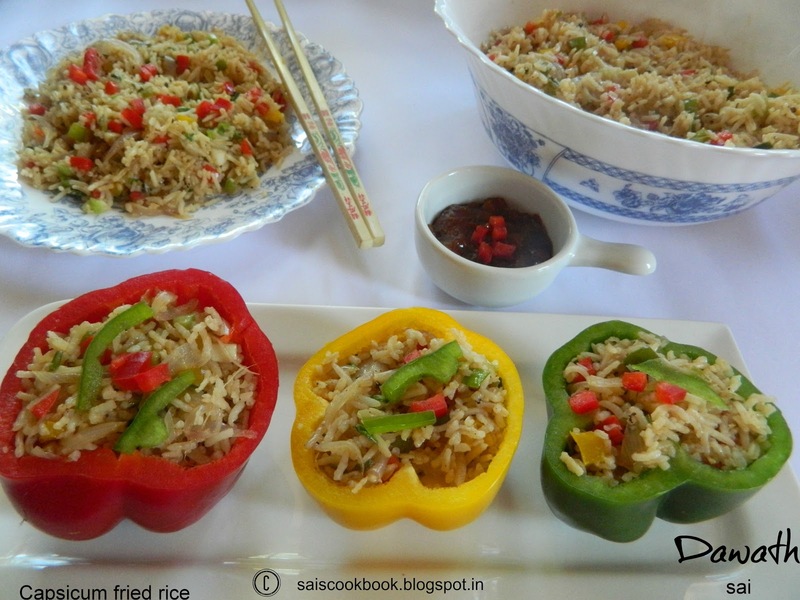 Capsicum fried rice or bell pepper rice is a colorful chinese rice with loads of capsicum.I prepared this for the fb group theme .Capsicum is the favorite at our place and this rice turned very tasty.Chinese food has always been a favorite at our place.This is a very simple preparation and hardly takes 30 minutes to cook.Capsicum is known by other names like bell pepper,cayenne,hot pepper,yellow pepper etc.Like other veggies ,capsi too has nutritional benefits and are rich in Vitamins.You may relish this awesome rice with chinese gravy,sauce or just like that.I like to relish chinese rice with North Indian gravy and I prepared the combo of Pudina chicken today,since my kids wanted that combo.I have already posted Egg fried rice . Cook the rice until half cooked,don’t overcook it,drain it in a colander, run it under cold water to stop cooking further and drain the water completely and refrigerate the rice until you use it. Take a wok and add 2 tbsp refined oil,add minced garlic and fry for a minute. Add onions and fry for 3-4 minutes,add capsicums and toss well for 3-4 minutes. 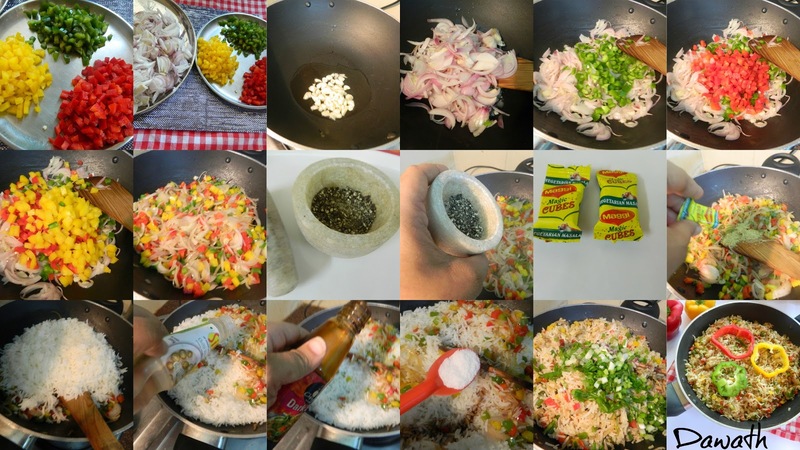 Add cooked rice,seasoning cubes,pepper powder,soya sauce,vinegar and fry it in high flame. Lastly add chopped spring onions and fry for a minute. Relish it with sauce or gravy. 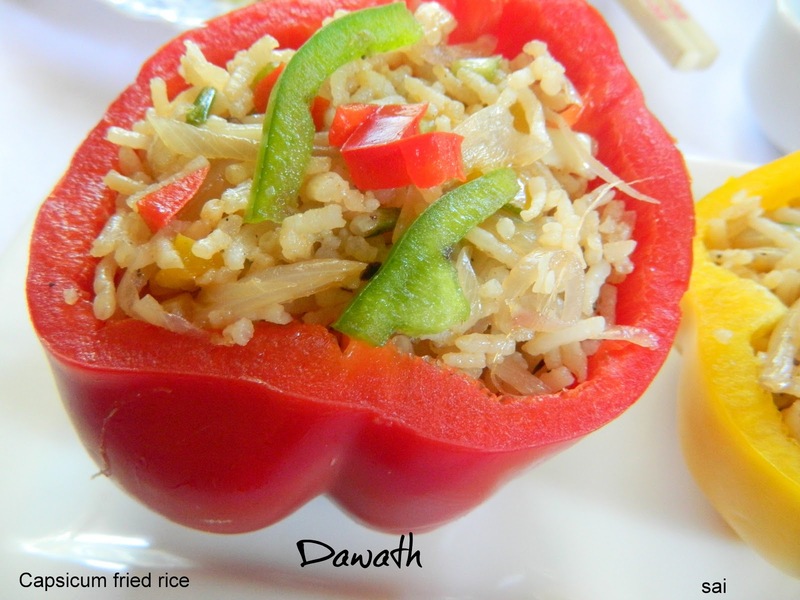 You may also cook the rice overnight and refrigerate it. 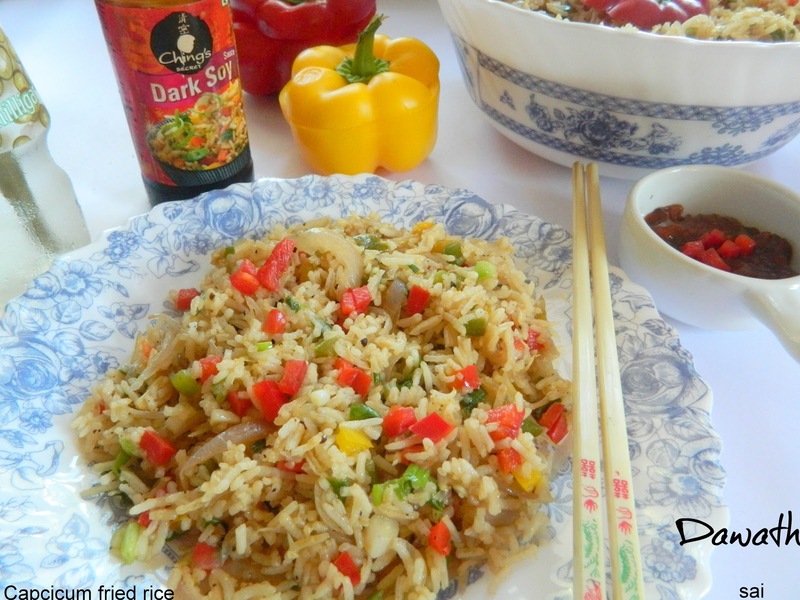 You may also use normal rice or leftover rice. 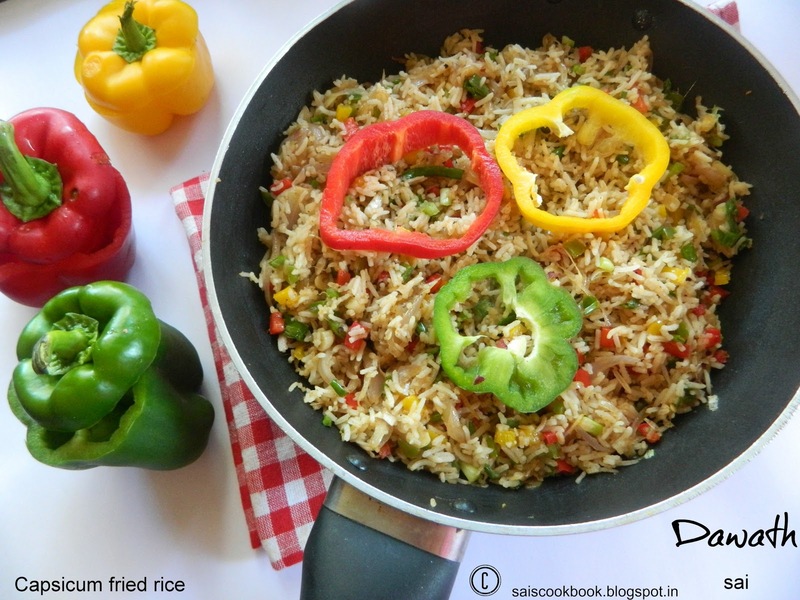 You may also add other veggies to make it a veg fried rice. Try to keep the veggies crunchy,dont over cook it. 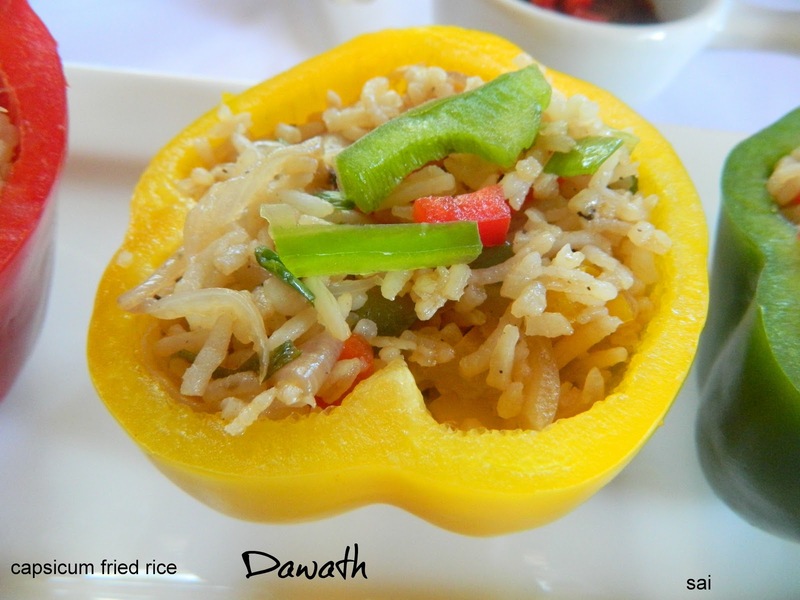 You may also cook the rice in a rice cooker or microwave. I strictly do not use MSG in my chinese cooking as it is very injurious to health. Once you cook 1 cup rice it will be doubled to approx 2 cups,so 2 cups cooked rice. For 1 cup of rice, boil 4 cups of water in a vessel,add washed basmathi rice and simmer for 10 minutes.Once the grains are just cooked,off the flame and drain the rice in a colander,run cold water and drain the water completely,refrigerate the cooked rice until you use it.Don’t over cook the rice.